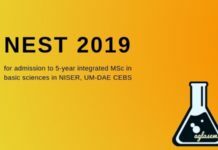 NEST Application Form 2019 – NISER Bhubaneswar is released NEST 2019 Application Form on January 7, 2019. Portal for online applications is opening on January 3, 2019. 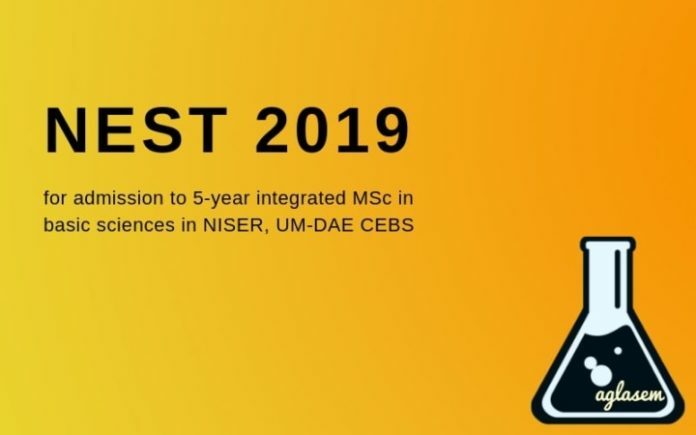 Candidates who wish to take admission in 5-year Integrated MSc program in NISER or UM-DAE CEBS should apply for NEST Exam. National Entrance Screening Test is conducted as an online test for class 12 students. Those who apply and pay the fee on time can download admit card of NEST 2019 before the exam. Get here complete details of NEST Application Form 2019 including dates, fees, how to apply. Latest: Last date of submission of Application form of NEST 2019 has been extended up to March 18, 2019 midnight. Apply online through the link provided below. Schedule for NEST 2019 Application Form:- All dates related to form filling of NEST exam 2019 have been announced. Check the table below for the same. 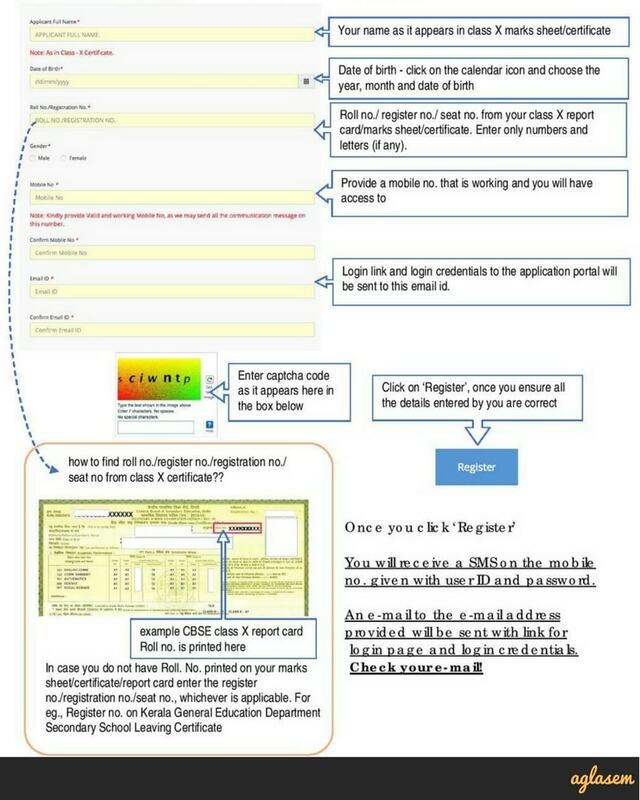 Click here for NEST Application Form 2019. Click here to check the steps for online registration/How to apply. Candidates need to pay a required fee amount in order to submit application form of NEST 2019. Fee amount and mode of payment are as follows. 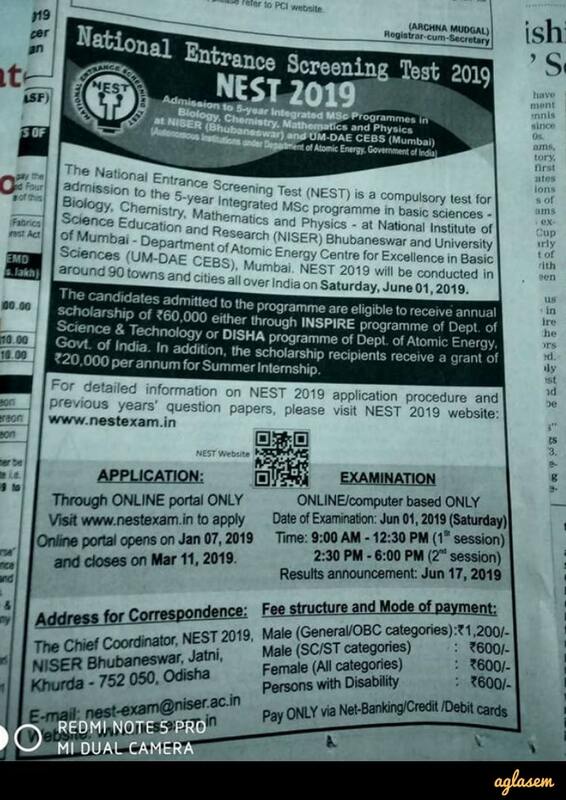 Check notification below to know more details of NEST exam 2019. How to apply for NEST 2019? Candidates who wish to fill on-line application must visit the NEST 2019 website www.nestexam.in and follow the detailed step-by-step instructions to fill up the application form. Salient points of the procedure are mentioned below. The first think you should do when you reach the official website is to download information brochure and syllabus. You will need these things when you fill application form. So arrange for them before you start filling form. 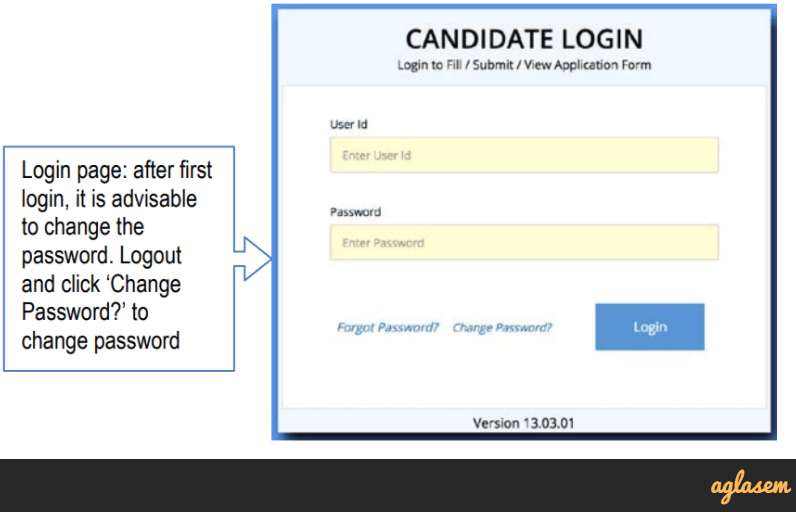 The following screen appears when you click ‘Online Application’ tab on www.nestexam.in. On clicking ‘Register’ button, you get an SMS on the registered mobile number. This SMS will contain user ID and password. You will also receive these details on your registered email ID with a link to login check your email! Click on the login link provided in email. 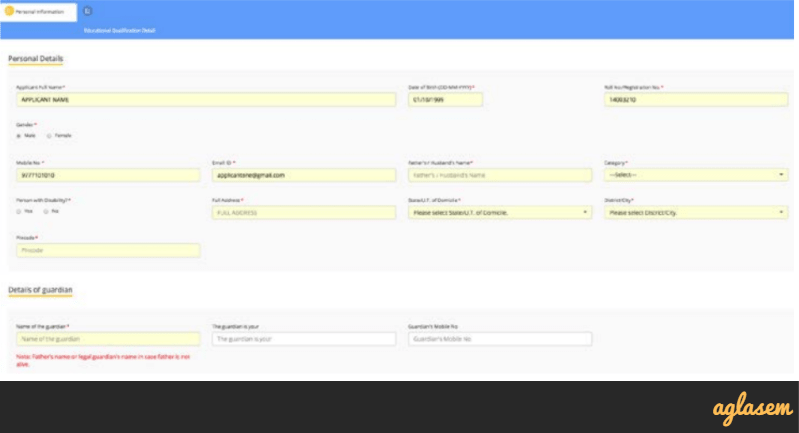 This takes you to the login page as promised. Now enter user ID and password given in mail. The fields for your name, date of birth, Roll no./ Registration no, mobile number and e-mail are pre-filled from registration information. You cannot edit those. In the event that you have filled wrong information in these fields you will have to follow due procedure that involves mentioning your user ID, name, e-mail address used for registration, and the details to be modified. Note: helpdesk will send e-mails to only the e-mail address provided at the time of registration. Enter other details. Note that all form fields with * marks are compulsory. 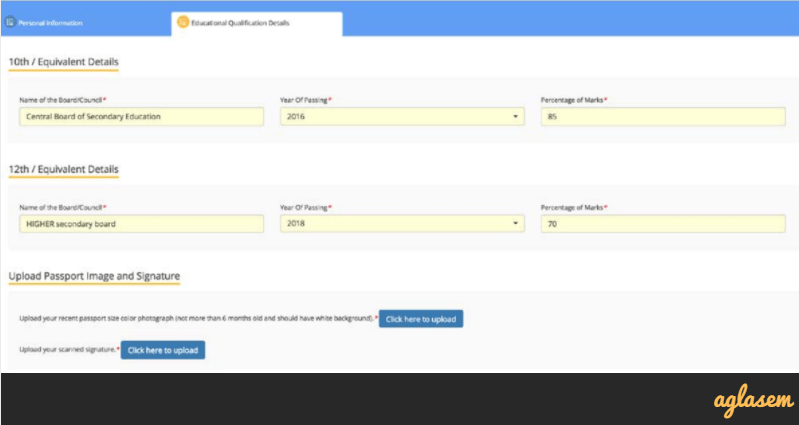 You cannot submit your form with any of these fields left unfilled. Now you select city / town from the dropdown list for each preference field numbered preferences 1 to 5. The exam conducting body will try their best to allot you a NEST 2019 exam center with in your first three preferred cities/towns. However, in case of unavailability, they will allot you next preferred cities. You should treat the exam center details given in your admit card as the final test center allotted. Press ‘SAVE AND NEXT’’ to save the data and move to the ‘Education Qualification Details’ tab. You can now upload a passport size photograph and a scanned image of your signature. In order to do so you will click the tab ‘click here to upload’. Note that you can only upload .jpeg or jpg extension files. Also note that size of each file should be less than 80 kb. Regarding the photograph it is important to keep in mind that it should have white background and should not be older than six months from the date of application. In the NEST application form you will pay fee through SBI payment gateway. Here you will get the option to pay using debit cards/credit cards issued by all major banks or through net banking facility. Note: SBI payment gateway and your bank may collect transaction charges, which are typically 1-3% (depending on the bank) of the application fee. Upon successfully submitting fees, the payment gateway page will revert to NEST 2019 application site. Here it is critical to note that you should not press refresh or back button. Depending on your network speed, it may take a few minutes for the payment gateway page to show success message and reverting back to your NEST 2019 application page. It is advisable to keep the transaction id of the payment written down for easy reference. Read the declaration and click in the white box next to ‘I agree’, and then ‘submit’. A summary page will be generated with all the details entered. This completes your application submission. Candidates should keep a copy of the NEST 2019 Application Form until end of admission process. Keep it safely until you get NEST 2019 Result and your admission concludes. If you have any queries regarding NEST Application Form 2019, please ask in the comments below. Can i change my test centre for nest 2017?? Actually I want to apply for nest exam but its too late .How can I apply through fine payment? Dear Sir, My son user ID:N19002029 Ihave paid fees 1200 twice by mistake j kindly guide how to get refund?